In an age where fake news is around every corner and national news outlets pander to the lowest common denominator of viewers, a small group of faculty at Capital have decided to get all of their news from the university’s official student newspaper, the Chimes. The Chimes, which has been published weekly since the fall of 1926, is entirely student-run and as such is not considered part of the lamestream media. 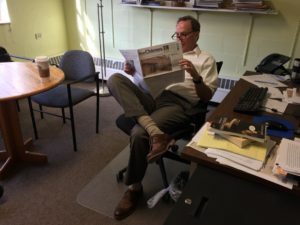 Landerson said that the Chimes is committed to bringing the campus community the whole “capital T truth,” and that he appreciates the readership and trust of people like Professor Wiltbrunner. But others do not think the Chimes is so balanced and fair in their coverage. Other students criticized the Chimes for not doing enough event recaps and listicles. Another faculty member who has decided to only read the Chimes is adjunct history professor Marvin Saucerman. The last print issue of the Chimes for the semester will be released on April 6, with publication not resuming until August. Wiltbrunner and Saucerman said that they are unsure where to get their news in the meantime.